Asus U33 U42 U43 U52 U53 Notebook Replacement Battery A31-U53 A32-U53 A41-U53 A42-U53| 14.8V 8 cell 5800mAh 84Wh """
Our premium high performance Asus A31-U53 A32-U53 A41-U53 A42-U53 Battery is the best performing battery made today! We use Panasonic's Advanced NNP cell technology to ensure this battery is loaded with extra power and has a very long service life . All cells are UL1642 safety rated and designed for enhanced US and Euro Zone safety standards. *** Massive amounts of power to enable you to run longer 30-50% longer then comparable 6 cell or other discount brands. 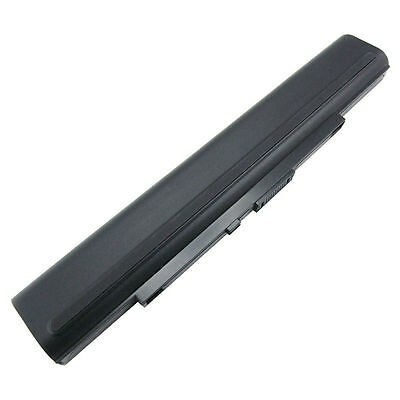 Our long lasting Asus A42-G74 battery is the best performing laptop battery made today. Our laptop batteries even outperform your original manufactures. If you have been disappointed by Amazon replacement batteries, then our battery was made for you. We exclusive use Panasonic's Advanced NNP cell technology and all cells are UL1642 safety rated and designed for enhanced US and Euro Zone safety standards Want the best, the best is Max Capacity. Power On and Stay On! New HRL Technology combined with traditional IC power management makes our laptop batteries VERY safe. Our laptop batteries remain particularly safe thanks to the use of a patented Heat Resistant Layer built into every battery cell we use. This solution consists of an insulated metal oxide film between the electrodes, which prevents overheating even in the case of an internal short-circuit. When added to state if the art power management circuity, HRL Technology makes Max Capacity laptop batteries particular safe! Lastly, all cells we put in our products are UL 1642 certified. This is a safety and quality issue that we insist on for our brand's reputation and our customers safety.